We all have bacteria in our stools. There is normal “bad” bacteria and “good” bacteria in our digestive system and therefore stool. This is normal biological flora. The “good” bacteria keep the “bad” bacteria in check. That is why it is never a good idea for us to eat poop! When an animal (us included) is under stress, the good bacteria can’t keep the bad bacteria in check and the bad bad bacteria proliferates and causes problems. Antibiotics tend to wipe out both good and bad bacteria. Probiotics help replenish the gut with healthy normal flora. Healthy bacteria are necessary to help the digestive process and to fend off the bacteria that can cause problems. Signs of a bacterial problem are off color stool or mucous in the stool. Hedgehogs have a very short digestive tract so when they are under stress or they are introduced a new food then the stool can be “off” as it is being expelled too quickly. For example, your hedgehog has normal stool at home but at your well-pet veterinary exam your hedgehog has green stool. The veterinarian may take a look at the stool and see an above average population of “bad” bacteria. My experience is that since hedgehogs have different “normal” stool than other animals some veterinarians may misdiagnose either normal stool as having a problem or stress induced abnormal stool. Abnormal stool certainly does indicate a problem and respective treatment. Remember, it is always a good idea to introduce probiotics when antibiotics are given with time in-between the probiotic and the antibiotic. Age can be a factor as both young babies and older animals often have a harder time digesting food. 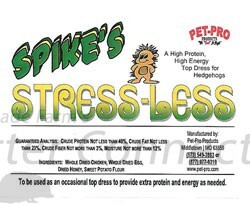 We use a product called Stress Less that we helped formulate with Pet-Pro Products. http://www.pet-pro.com/index.php?main_page=product_info&cPath=1&products_id=41 It is a high protein, high energy food supplement that includes whole dried chicken, whole dried egg, dried honey, and sweet potato flour. It is great for that extra boost and for palatability issues. This product has dramatically helped our herd in conquering abnormal stool caused by a variety of stress related issues. It is the first thing we give our hedgehogs if they are off food for even one night.